Director – Mark Robson, Screenplay – Ardel Wray, Producer – Val Lewton, Photography (b&w) – Jack MacKenzie, Music – Leigh Harline, Music Supervisor – C. Bakaleinikoff, Art Direction – Albert S. D’Agostino & Walter E. Keller. Production Company – RKO Radio Pictures. 1912 during the Balkan Wars. American war correspondent Oliver Davis accompanies the cruel Greek General Nicholas Pherides out to a small island as Pherides goes to visit the grave of his wife. However, they find the grave desecrated and the island infected with septicaemic plague. The General orders the island quarantined. He comes to believe that the Greek maid Thea, who tends the ill British Consul’s wife Mary St Aubin, must be a vuvoloka, a native wolf spirit that walks the Earth in human form to drink human blood. When Mrs St Aubin dies, she is crated up, only for them to discover that she suffers from catalepsy. For a brief period during the 1940s, Val Lewton made a series of horror film at RKO Radio Pictures beginning with Cat People (1942). (The other Val Lewton titles are listed below). Lewton’s films hovered in an eerily ambiguous place, invoking in both the audience and the characters on screen an uncertainty as to whether the manifestations of the supernatural were real or merely imagined. Val Lewton’s films and their shaded ambiguities are some of the most subtly haunting of all horror films. 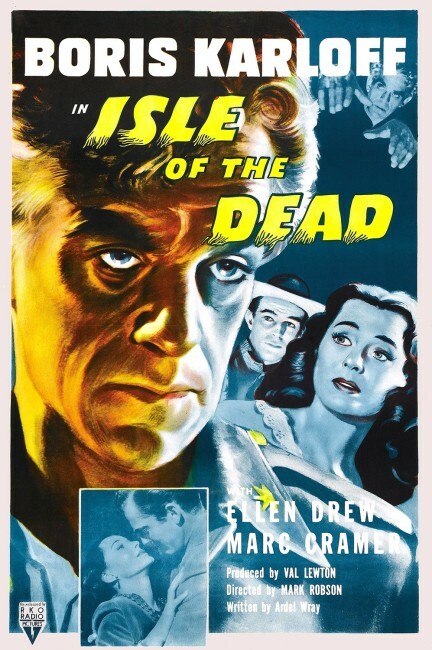 Isle of the Dead is one of the lesser of the Val Lewton films. His customary ambiguities have been assembled in a much dryer and more consciously literary way than usual. Metaphors and puzzles are established on every level – science vs. superstition, catalepsy or death, death by natural cause or vuvoloka and so on. However, once all its elements in place though, Isle of the Dead winds its way towards an ending that seems at best a rudimentary wrap-up. The film only engages on an intellectual level – one can appreciate the ideas, the equivocalities, but unlike Cat People or I Walked with a Zombie (1943), the ambiguity never holds one glued to the film. 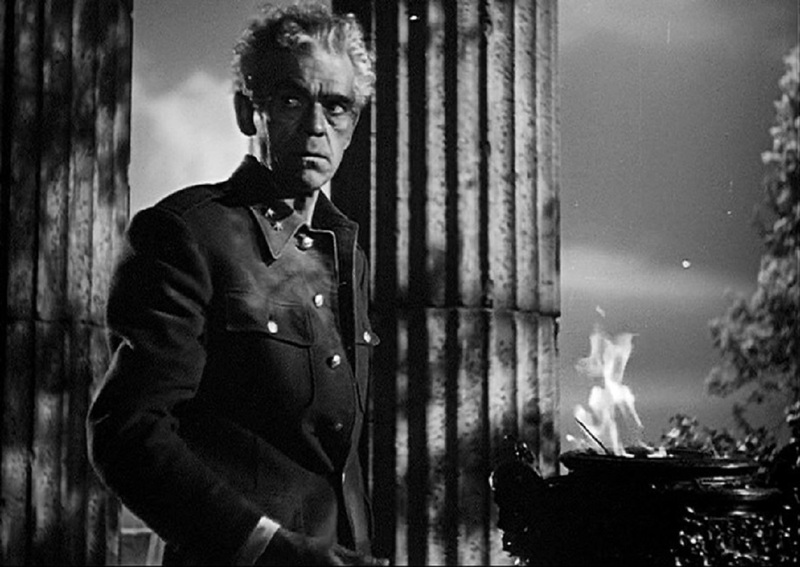 The sole exception is a scene where Boris Karloff starts giving into belief in the vuvoloka and terrorises Ellen Drew, questioning if her memories are real and immediately jumping on the fact that all she remembers of her nightly vigils is touching Katherine Emery’s throat. The premature burial is nicely conveyed – water dripping on the crate while noises are heard from within the box, the haunted singing heard in the crypt, and the minute dilation of Katherine Emery’s nostrils. As usual with the Val Lewton films, a lack of budget prevents the film from conveying anything of the potentially moody locations. Outfitted in a blonde, perm Boris Karloff is somewhat unconvincingly cast and his lisping pensiveness holds little of the cold cruelty his character is said to possess. The title and central image of the film incidentally is taken from a painting by the 19th Century Swiss Symbolist artist Arnold Bocklin. Val Lewton’s other films are Cat People (1942), The Ghost Ship (1943), I Walked With a Zombie (1943), The Leopard Man (1943), The Seventh Victim (1943), The Curse of the Cat People (1944), The Body Snatcher (1945) and Bedlam (1946). Val Lewton: The Man in the Shadows (2007) is a documentary about Lewton and his films. After making his debut as director and making four films for Lewton – The Ghost Ship (1943), The Seventh Victim (1943), this and Bedlam (1946) – Mark Robson became a mainstream director with films like The Bridges at Toko-Ri (1955), Peyton Place (1957), Von Ryan’s Express (1965) and Valley of the Dolls (1967). His other films of genre interest are the psycho-thriller Daddy’s Gone A-Hunting (1969) and the disaster movie Earthquake (1974).